August is upon us, and although we have shifted to our traditional summer schedule, we wanted to fill you in on the latest in Russian art and culture, and give you something to look forward to in September. Moscow’s Garage Museum of Cotemporary Art has had an eventful summer. 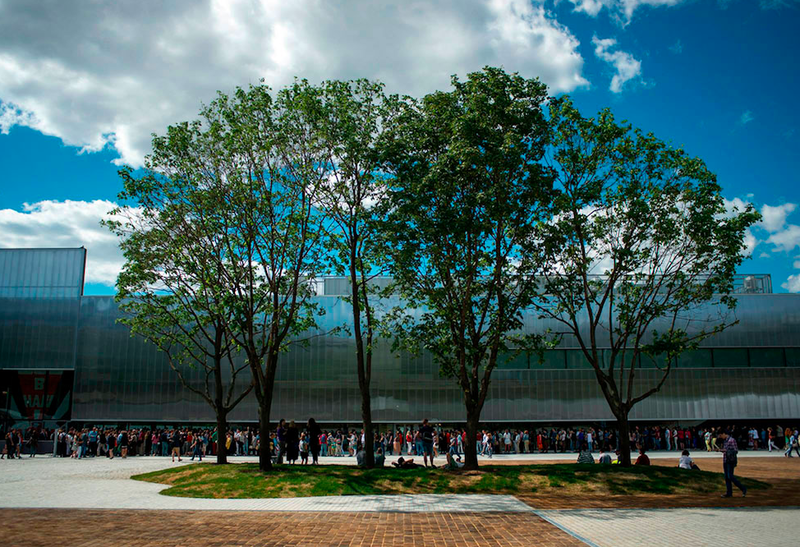 After a very successful opening of the new building in June, this past weekend marked the last days of the museum’s temporary Shigeru Ban – designed building in Gorky Park. Starting Monday, the museum will move all educational programming and exhibitions to its lauded Rem Koolhaas – designed building next door. For those who haven’t bothered to read the news this summer: Garage presented its new venue with a grand opening that included exhibitions and special projects by Rirkrit Tiravanija, Yayoi Kusama, Katharina Grosse and Erik Bulatov. Koolhaas’ new space for Garage is a former soviet – era 1000-seat restaurant called Vremena Goda reconstructed to become a sleek home for what is arguably the most ambitious contemporary art institution in the post – Soviet landscape. Koolhaas restored and remodeled the Brezhnev – era structure, transforming its façade by wrapping it in translucent polycarbonate, a hi-shine material that reflects the surrounding park and sky. Dasha Zhukova, the museum’s founder, doesn’t intend to stop there: Garage plans a future expansion into what is known as the Hexagon pavilion, a 1920s structure also located in Gorky Park. For now, however, the curators are working hard on programing their new building: with programming for Garage planned well into 2017, we can’t wait to hear what’s next – after the major Louis Bourgeois retrospective in September, that is. September will also see the opening of the 6th Moscow Biennale. However, this time around, the biennale, curated by Bart De Baere, (Director of MUHKA, Antwerp); Defne Ayas, (Director of Witte de With Center for Contemporary Art, Rotterdam) and Nicolaus Schafhausen (Director of Kunsthalle Wien, Vienna) will run only for 10 days due to “challenging circumstances” (or, as we hear, serious financing issues). In view of these difficulties, the curators have decided to focus the show on performances, workshops and lectures rather than an elaborate exhibition program. Organizational issues are not the only problem with this Biennale – it’s theme, “How to Gather? Acting in a Center in a City in the Heart of the Island of Eurasia”, is also highly questionable, especially considering Russia’s nationalist – expansionist politics. The full program of the show has not yet been announced, but artists such as Rana Hamadeh, Anton Vidokle, Fabrice Hyber, Alevtina Kakhidze, Flaka Haliti, Taus Makhacheva and Amalia Ulman have already pledged to participate. To our great regret, August was marked by the passing of Svetlana Boym (b. 1959), an artist, writer and professor of Slavic Languages and Literature as well as Comparative Literature at Harvard University. Boym’s writing on the works of artists Vladimir Tatlin, Kazimir Malevich, Ilya Kabakov and others are a remarkable contribution to the scholarship of Russian art and culture. Her many publications include KOSMOS: Remembrances of the Future (Princeton Architectural Press, 2001), Another Freedom (University of Chicago, 2010), and The Future of Nostalgia (Basic Books, 2002). Boym will be greatly missed by friends, family and colleagues. For a more detailed profile on the scholar and artist, please read Masha Gessen’s profile in the New Yorker magazine. Svetlana Boym is the second great Slavic scholar to pass away this year. In March, Slavic academia lost Catherine Nepomnyashchy (b. 1951), Ann Whitney Olin Professor of Russian Literature and Culture and Chair of the Slavic Department of Barnard College and member of the Executive Committee of the Harriman Institute at Columbia University, which she headed from 2001 to 2009. Cathy’s research spanned twentieth- and twenty-first-century Russian literature and popular culture, Russian women’s studies, and the works of Alexander Pushkin and Vladimir Nabokov. Cathy’s memorial service will be held on Friday, October 2, at James Memorial Chapel at Union Theological Seminary in New York, with a reception to follow at Barnard College – all are welcome to attend. The gap left by these two remarkable women will be impossible to fill as they leave a rich legacy of breaking glass ceilings in academia and contributing significantly to Slavic scholarship. We are lucky to have their published texts in perpetuity – so if you’re still looking for some summer reading, add their books to your list.